If you happen to be one of the fretful minority who can do creative work, never force an idea; you’ll abort it if you do. Be patient and you’ll give birth to it when the time is ripe. Learn to wait. 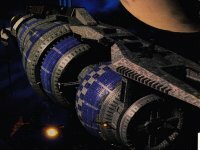 Your SciFi Universe is: Babylon 5! Your SciFi Universe is: Babylon 5. Beware of Shadows! You’re from a distant future generation, where Babylon 5 is our last, best hope in the fight to survive in an increasingly harsh universe. You feel at home at the centre of galactic civilisation, watching from the sidelines as the Narn and Centari battle it out for basic resources! Question is: Are you working for the Shadows!